A person working with DYMET® equipment should have permission to work with electric instruments and compressed air and should be instructed by the supplier on work rules and techniques. Treated components should be allocated in dust-protective chamber, which might provide easy access of spraying unit nozzle. Working personnel should be supplied by individual dust-protective wear (glasses, respirator). Filter should provide cleaning of dusted air from dust (powder particles, which did not adhere to treated surface). Ventilator should effectively remove dusted air from ‘dust-protective chamber – filter – air pipes’ system. The capacity of ventilator loaded on filter should be not less then 2 m3/min. 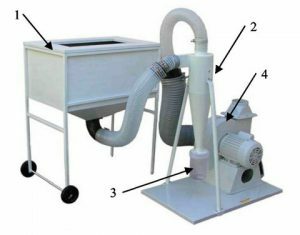 Ready industrial dust removers with enough air filtration level and capacity or specially designed systems (which may include cyclones, fine cleaning filters and ventilators) can be used as dust removing systems for work with DYMET® equipment.